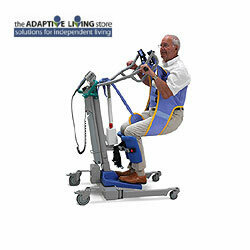 The Sara 3000 Transfer Sling provides support for a seated transfer with Sara 3000. ArjoHuntleigh Sara 3000 Transfer Sling is designed for supported transfers in a seated position. The Sara 3000 Transfer Sling is suitable when a patient needs extra support for a seated transfer with Sara 3000. It comes in one size with a Safe Working Load of 200 kg/440 lbs.